Cover of Creatures of Imagination by Carol Willett. Outer Banks authors are a diverse lot writing everything from children’s books—Suzanne Tate and her Nature Series; to history—David Stick; mystery—Joseph Terrell, and even a best selling novelist who has settled here. That would be Matthew Quick, author of Silver Linings Playbook and his latest novel, Love May Fail. 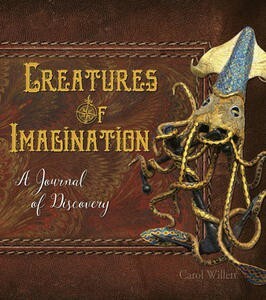 Add to that list Carol Willett’s Creatures of Imagination-A Journal of Discovery. Words fall short in describing how marvelously different this book is. Carol has been creating art in the form of whimsical mythical creatures for a number of years, and her book takes that whimsy to a whole new level. Telling the story of intrepid 19th century world-traveller, Gwendolyn Remington-Burke, Carol traces her heroine’s journey from her native England to the four corners of our planet. Her story is recounted through journal entries, primitive photographs and paintings that recreate the creatures she encounters as she circles the globe. Typical of her entries is this from 3 August 1889. The journal entries are guaranteed to keep the reader chuckling; Carol’s artwork is spot-on and adds perfectly to the sense of adventure the book evokes. A large format book, beautifully produced by Linda Lauby of Outer Banks Press, this is the kind of book that will engage just about everyone. Just published, the book is available at the Dare County Arts Council in Manteo, Glenn Eure’s Ghost Fleet Gallery in Nags Head and should be making its way to other locations soon.